Furo (風呂), polite form ofuro (お風呂), is a Japanese bath. Specifically it is a type of bath which originated as a short, steep-sided wooden bathtub. Baths of this type are found all over Japan in houses, apartments and traditional Japanese inns (ryokans) but are now usually made out of a plastic or stainless steel. 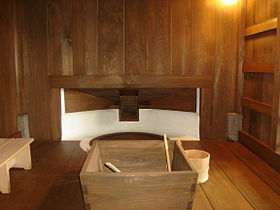 Furo are part of the Japanese ritual of bathing, not meant for washing but rather for relaxing and warming oneself. Washing is carried out separately outside the yubune. The bather should enter the water only after rinsing or lightly showering. Generally Japanese bathrooms are small by Western standards, so the bathroom is set up much like a walk-in shower area but containing the furo. Since the bathroom is a complete wet-area, in modern buildings and ryokan heating is provided by air conditioners overhead. The water is hot, usually approximately 100 to 108 degrees F (38 to 42 degrees Celsius). A modern furo may be made of acrylic, and the top of the range models fitted with a re-circulation system which filters and re-heats the water. This system is connected with the hot water heater, either for gas/propane fired or electric/heat-pump types. Luxury models are still made out of traditional or expensive woods like hinoki, and can be retrofitted with Western-style fittings and used as signature pieces by architects and interior designers internationally.